In Brussels, a new school complex will be built, containing a day-care center, a primary school, a secondary school and two gyms. This extensive program is ingeniously fit to a plot that is in principal not large enough. The school complex will accommodate a day-care center for 72 children, a primary school for 456 kids, a secondary school for 288 pupils and two sports facilities. Each of the schools will have their own recognizable identities, their own entrances and separate schoolyards. All of this has to fit on a plot of 5.500 square meters. The urban framework poses extra limitations: it has been decided to only build alongside of the street, creating a closed city block. The maximum height of the new building is 15 meters and the maximum depth 12,15 meters. In fact, it does not fit. 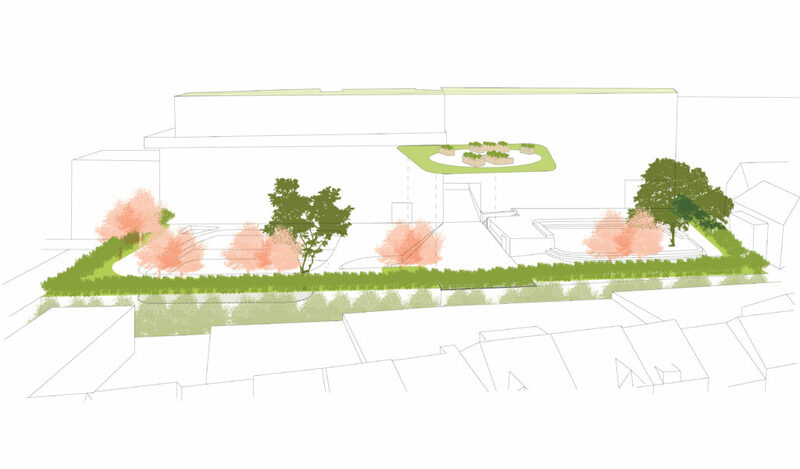 In addition, a height difference between schools in the plot of nearly 7 meters complicates the project. Granting all wishes within these strict constraints was a complex puzzle. It required intensive cooperation and careful calibration between architecture, landscape architecture and engineering. 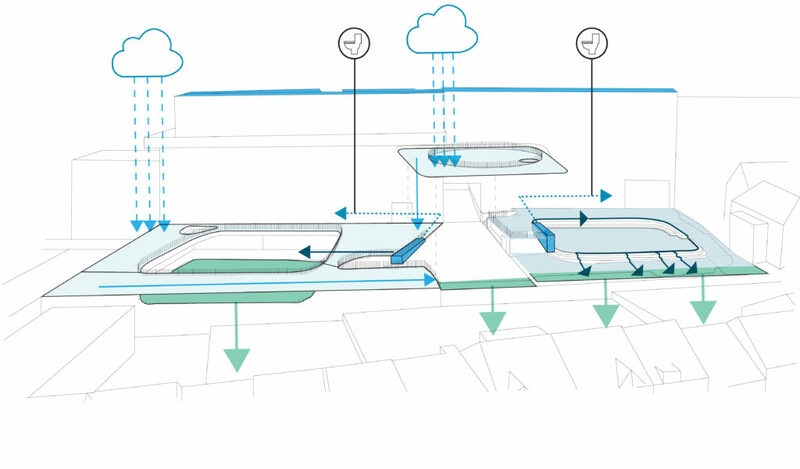 In order to realize the program within the limitations of the plot part of the building was placed underground. 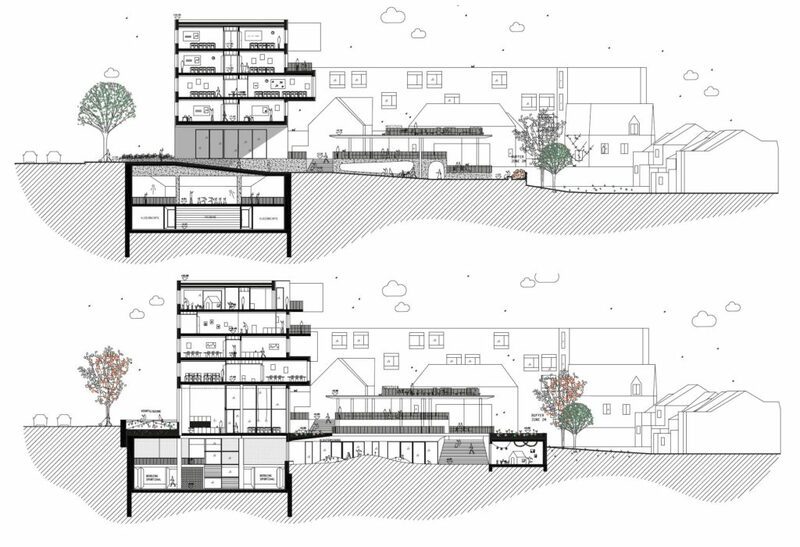 The schoolyards are situated on different levels resulting in a stacked landscape, inspired by Asian rice fields, or the hanging gardens of Babylon. The gyms are built completely underground. 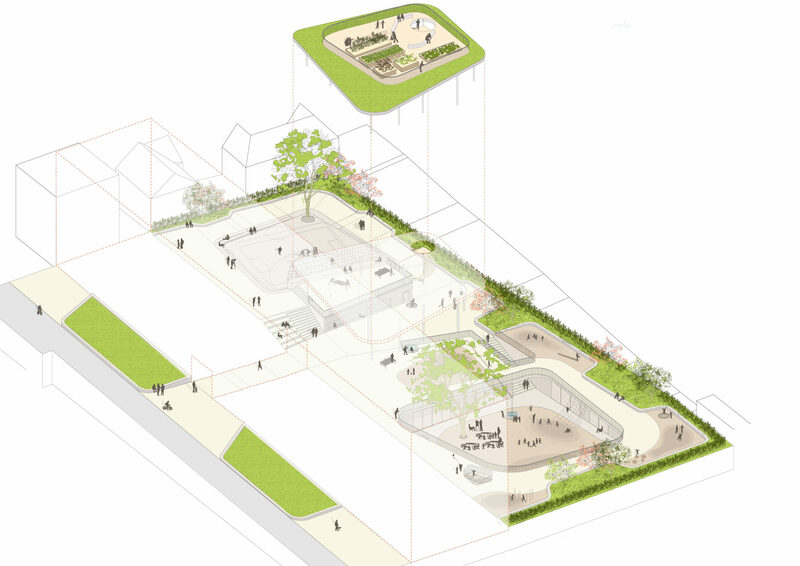 The kindergarten classrooms are grouped around a sunken, atrium-like courtyard. Above that, the primary schoolyard is located. An indoor bicycle parking separates this area from the secondary school. On the roof of the bicycle parking a lounge area is created with ping-pong tables. Covering all that is a large awning; Belgian regulations require schools to provide sheltered outdoor spaces for their students. On top of this awning, a vegetable garden is established. The different levels naturally create separate outdoor areas. 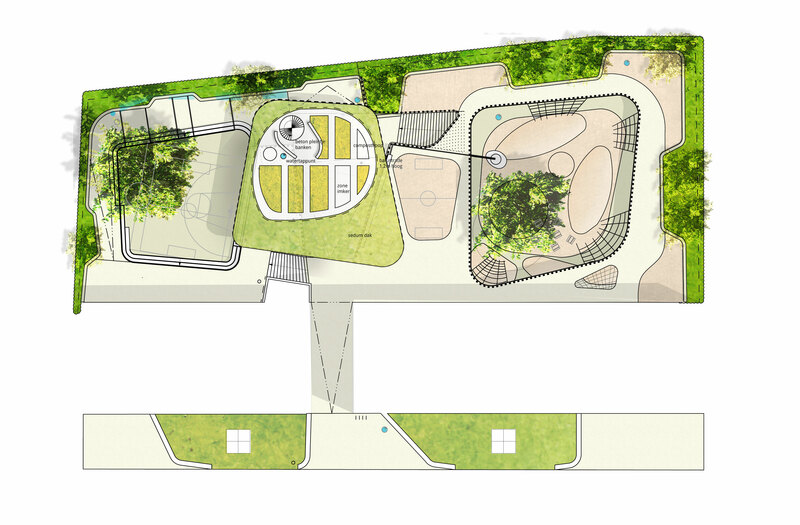 The transitions provide exciting play-zones with slopes, slides and stairs. In addition, the whole complex is accessible for disabled people.